You are currently browsing articles tagged Great Commission. Representatives of the Christian Education committees of the Orthodox Presbyterian Church and the Presbyterian Church in America met in Philadelphia, Penna. on November 22, 1974 to inaugurate a joint publication enterprise to serve both denominations. Temporary officers of the new corporation are the Rev. Messrs. Robert Nicholas (OPC), chairman; Harold Borchert (PCA), vice-chairman; Kenneth Meilahn (OPC), secretary. The group also named the Rev. Robley J. Johnston, long-time generaI secretary for the O. P. committee, to be executive director. A tentative schedule of production calls for a new Adult Sunday School series to be ready in the Fall of 1976; a new VBS curriculum for Summer 1977; a new Senior High Sunday school course for Fall 1978; and a Pre-school curriculum for Fall of 1979. A spirit of confidence and unanimity has permeated discussions leading up to this joint endeavor. Problems for the future success of the venture are mainly in the area of securing needed and competent personnel for the proposed schedule of publications. The Presbyterian Guardian, December 43.10 (December 1974), p. 167. That the brethren can work together has been proven quite well in this venture, now some forty-two years later. Great Commission Publications does a wonderful job of fulfilling many of the Sunday School curriculum and other literature needs of the OPC and PCA. Other churches besides these two also utilize the services of GCP on occasion. The entire venture has been a good success, to the praise of our Lord and Savior. 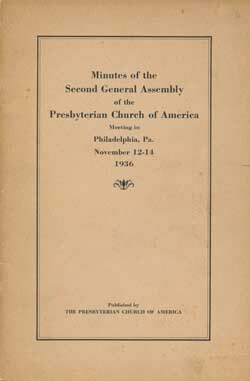 It was at the close of the First General Assembly of what was originally named the National Presbyterian Church (a year later, renamed the Presbyterian Church in America) that a message was sent to all churches of Jesus Christ throughout the world from this new denomination. Adopted and then sent on December 7, 1973, the elders of this new Presbyterian Church wished everyone to know of their principles and convictions which occasioned this new Church. They also declared that they believed the system of doctrine found in God’s Word to be the system known as the Reformed Faith, as set forth in the Westminster Confession of Faith and Catechisms. They wanted everyone to know that this Reformed Faith is an authentic and valid expression of Biblical Christianity. A third conviction was expressed to renew and reaffirm their understanding of the nature and mission of the Church. To them, Christ is King and the only Law-giver, having established the Church as a spiritual reality. It is composed of all the elect from all ages, manifested visibly upon the earth. The chief end of man’s existence—our very reason for living—is to glorify God. That truth, reflected in the first answer of the Westminster Shorter Catechism aim, also implies that we give top priority to the Great Commission of our Lord Jesus Christ which speaks to going into all the world, preaching the gospel, and disciplining all nations, bringing them into the church. Last, they sought a return to the historic Presbyterian view of Church government from the Session of the local church to the Assembly of all the local church representatives. With a closing invitation to ecclesiastical fellowship with all who maintain their principles of faith and order, the address came to a close. 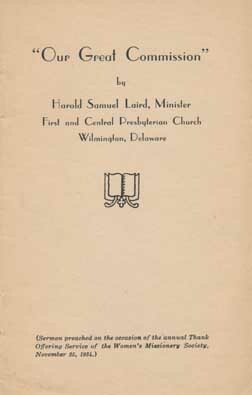 Words to live by: Even though the name was changed from National Presbyterian Church to Presbyterian Church in America in the next year after the publication of this Address, the principles and convictions have remained the same in this now forty year old church. If you are not in a Bible-believing, Gospel-preaching Presbyterian and Reformed church, prayerfully consider the testimony and witness of the Presbyterian Church in America. To read the entire “Message to All Churches of Jesus Christ throughout the World,” click here. A speaker over the phone actually said the words of our title to a friend of this author. She was shocked, and so was I upon hearing it. Have they snipped out by scissors the Great Commission in Matthew 28:18 – 20? The very existence of our Presbyterian Church in America is that of being committed to the Great Commission. Certainly the subject of our post today when he sailed for the New Hebrides in 1846 was for the purpose of evangelism. His name was John Geddie. John Geddie was born in Scotland on April 10, 1815 to John and Mary Geddie. At the tender age of two, his parents sailed to Pictou, Nova Scotia in Canada. Joining the Succession Presbyterian Church there, the young Geddie was trained in the ordinary schools of that province while joining his father in his clock making business. But his real interest was spent in reading books sent by the London Missionary Society. He was brought to a saving knowledge of Christ as Lord and Savior through these means at age nineteen. Enrolling in theology courses, he would be licensed to preach the gospel in 1837 and ordained as a Presbyterian minister one year later. Marrying Charlotte MacDonald in 1839, they set about rearing a family which eventually reached eight children. Having a call to serve the Lord outside of Canada was made difficult in that no Presbyterian church was actively involved in foreign missions. Geddie organized a mission society in his local congregation. Yet even with the organization established, missionary endeavors were slow in coming to fruition. This was all too obvious when the regional synod voted 13 to 12 to select a mission field to even evangelize! Yet one year later, on November 30, 1846, John Geddie, his wife Charlotte, and two small children sailed for the New Hebrides. Landing on the island of Aneiteum, they set at once to build a ministry among the natives. For the next fifteen years, they sought to be faithful to the Great Commission in the midst of these heathen tribes. Often John would be assaulted by spears and stones as he traveled from one place to another. Then six years after he landed, several native chiefs converted to biblical Christianity. Thirty-five hundred natives, nearly one half of the population, threw away their idols and avowed the true Jehovah as their God and Savior. Immediately, the converted natives began to obey the Great Commission and send Christian teachers to other islands in the chain of the New Hebrides. Indeed, if you look up the country today (known as Vanuatu), you will see their religion to be Christian. James Geddie died on December 14, 1872, but not before he had translated the entire New Testament in their language. He was in the process of working on the Old Testament when he was taken home to glory. A friend of this author had made one rule his guide in his ministerial life. For every milestone he passes, he endeavors to share the gospel with that many strangers in his ministry area. Thus, if he has turned fifty years of age, then he endeavors to witness to fifty unsaved individuals. Now, whether that goal brings 50 conversions is entirely dependent upon the work of the Spirit of God. We Reformed Christians understand that! But do we recognize the command of the Great Commission is to be carried out by us? Or is it our practice that we do not do evangelism? When some 260 churches decided to leave the Presbyterian Church in the U.S. (aka, Southern Presbyterian Church), to form the Presbyterian Church in America, that move was not simply formed on a whim or at a moment’s notice. For nearly thirty years, beginning in 1942, efforts by theological conservatives were unrelenting in trying to turn the mother Church back to unswerving orthodoxy. At last, with the PCUS about to merge with the UPCUSA, it was clear that the time had come to leave. Committees were formed and plans were laid for the establishment of the new denomination. A “Convocation of Sessions” gathered in May of 1973, and this convention in turn authorized the meeting of an “Advisory Convention,” whose purpose was to finalize plans for the meeting of the first General Assembly. The following letter, under the signature of founding father W. Jack Williamson, explains the process and the thinking behind these plans. 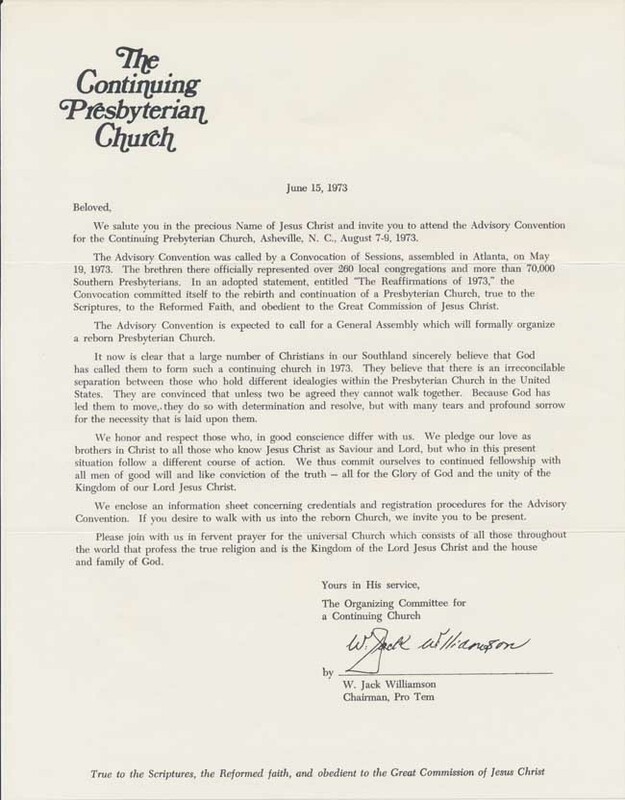 We salute you in the precious Name of Jesus Christ and invite you to attend the Advisory Convention for the Continuing Presbyterian Church, Asheville, N. C., August 7-9, 1973. The Advisory Convention was called by a Convocation of Sessions, assembled in Atlanta, on May 19, 1973. 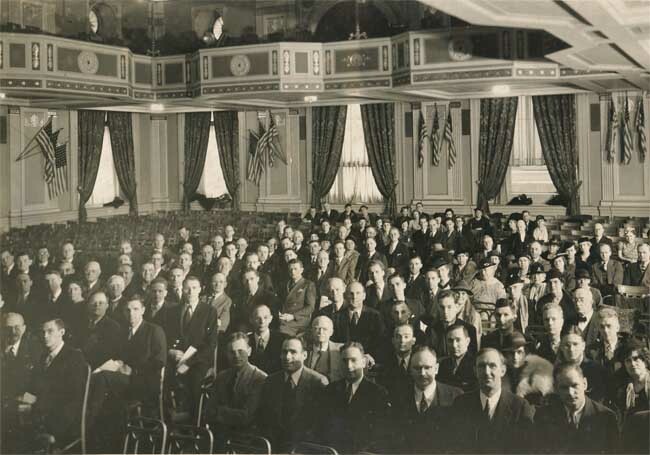 The brethren there officially represented over 260 local congregations and more than 70,000 Southern Presbyterians. In an adopted statement, entitled “The Reaffirmations of 1973,” the Convocation committed itself to the rebirth and continuation of a Presbyterian Church, true to the Scriptures, to the Reformed Faith, and obedient to the Great Commission of Jesus Christ. The Advisory Convention is expected to call for a General Assembly which will formally organize a reborn Presbyterian Church. It now is clear that a large number of Christians in our Southland sincerely believe that God has called them to form such a continuing church in 1973. They believe that there is an irreconcilable separation between those who hold different idealogies within the Presbyterian Church in the United States. They are convinced that unless two be agreed they cannot walk together. Because God has led them to move, they do so with determination and resolve, but with many tears and profound sorrow for the necessity that is laid upon them. We honor and respect those who, in good conscience differ with us. We pledge our love as brothers in Christ to all those who know Jesus Christ as Saviour and Lord, but who in this present situation follow a different course of action. We thus commit ourselves to continued fellowship with all men of good will and like conviction of the truth — all for the Glory of God and the unity of the Kingdom of our Lord Jesus Christ. We enclose an information sheet concerning credentials and registration procedures for the Advisory Convention. If you desire to walk with us into the reborn Church, we invite you to be present. Please join with us in fervent prayer for the universal Church which consists of all those throughout the world that profess the true religion and is the Kingdom of the Lord Jesus Christ and the house and family of God. When forty thousand Christians on December 4, 1973 started a new Presbyterian Church, they were understandably excited beyond measure for the fruition of plans to begin a Bible-believing, Gospel-preaching church true to the Scriptures, the Reformed Faith, and the Great Commission. Though they essentially had left the Southern Presbyterian church (PCUS), they had a vision of impacting the whole nation. So they named their denomination the National Presbyterian Church. They immediately however encountered a road block to the choice of that name. There already was a congregation by that name, the National Presbyterian Church, located in Washington, D.C., and this local church had a national mission to all the states and even beyond, primarily as an endorsing authority for military chaplains. So in the second year of its existence, the new denomination changed its name to the Presbyterian Church in America. National Presbyterian Church [the congregation] had its beginnings in two PCUSA congregations located in the nation’s capitol. The First Presbyterian Church, which began in the last decade of the seventeen hundreds in our nation’s capitol, was the home of countless presidents. Chief executives like Jackson, Polk, Pierce, Buchanan, Cleveland made this their Washington home church. The other congregation which joined to make National Presbyterian what it is today was Covenant Presbyterian Church. It was begun when eleven ruling elders of New York Avenue Presbyterian Church met in the home of Supreme Court Justice William Strong on March 11, 1883 to plant another Presbyterian church in the capitol. Its first service was in 1889 and it was dedicated in 1901. Early attenders were President Harrison and Alexander Graham Bell. It became the home church of President Dwight David Eisenhower, when he was elected to this high position. Both churches united and were designated as the National Presbyterian Church as an action of the Presbyterian Church USA in 1946. Thus, they did not wish any confusion as to what would be considered the National Presbyterian Church. In hindsight, the decision to change the denominational name rather than contest the matter, while gracious, was also providential. For so the churches, sessions, and elders who came out of the PCUS church in 1973 were then enabled to choose what their real calling was to be, namely, the Presbyterian Church in America. Words to Live By: God doesn’t ever make any mistakes. If an action in your life, or the life of your church, at first seems a puzzle, just wait for God’s providence to make it clear. Dr. Patterson was a son of the manse, his father having served for many years as a minister in the Presbyterian Church in the United States. He was graduated from Wheaton College and Columbia Theological Seminary. He served as pastor of the Commerce, Georgia Presbyterian Church, Perry, Georgia Presbyterian Church, West End Church of Hopewell, Virginia and the McIlwain Memorial Church of Pensacola, Florida and lastly as pastor of the First Presbyterian Church of Jackson, Mississippi. 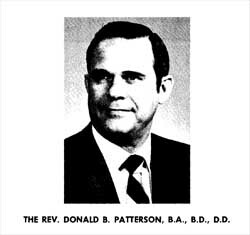 Dr. Patterson was Chairman of the Steering Committee for a Continuing Presbyterian Church and Chairman of the provisional Committee of the Mission to the World, while also serving as a member of the Mississippi Valley Presbytery of the Continuing Presbyterian Church. by the Rev. 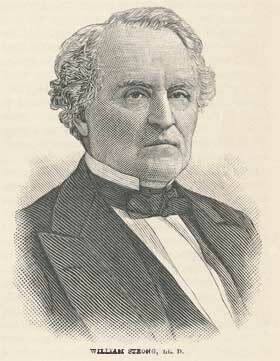 Donald B. Patterson, B.A., B.D., D.D. None of us would deny that we are living in a new day with all kinds of exciting opportunities for Christian witness at home and overseas. The future is as bright as the promises of God. I am impressed by the fact that those giving thought to the formation of a new denomination are facing up to the principle that the primary purpose of Jesus Christ in the world must never become a secondary cause in His church. Since the beginning of the Christian Church, it has been at its best when it is militantly evangelistic. Refined by violent opposition, a fierce dedication to take the Gospel to every man at any cost characterized our predecessors. Unfortunately, the Church has not been able to maintain its most dedicated missionary enthusiasm for very long, and having failed to polarize public opinion about Jesus Christ it has retreated from the arena of open evangelism. The Church has hidden behind symbols of strength and power — protected by its theological positions — while whole generations of unimpressed, uncommitted and unevangelized people go by outside. I may have misunderstood the Scripture, but my impression of the Church was that it was never meant to be some kind of a fortress out of reach of the people. The Church was to be an outgoing, proclaiming, evangelistic body of believers dedicated to the passion for the the world-wide evangelization of people. As I understand the command of Jesus, we are to preach the Gospel to every person, but no generation of Christians has ever come close to fulfilling the Great Commission in its own times. The likelihood of our evangelizing the world seems so remote that few of us even think about it — much less pray about it. In 1966 I attended the World Congress on Evangelism in Berlin where a population clock clicked off the increase in the world’s population while we sat in that meeting. Nothing made a more profound impression on me that week. When Christ was on earth there were approximately 300 million people on earth. 1500 years later it is estimated that there were 500 million. 300 years later there were one billion. Then man doubled his number in the next one hundred years. In 1930 there were 2 billion people! Between 1930 and 1960 man added another billion. They are now estimating that by the year 2000 there will be 6.5 billion people. There was a day when preachers were called the “prophets of doom,” but the title now goes to the scientists. The scientist with his charts and carefully researched prognostications is in the limelight. It has become obvious that if the Church is ever to evangelize the world it must greatly increase its level of missionary activity, or it will be too late to fulfill the Great Commission. In that first century Paul provided a working model that we would do well to follow — “all they which dwelt in Asia heard the word of the Lord Jesus, both Jews and Greeks.” (Acts 19:10). He reached the whole province — all the people! He effectively fulfilled the Great Commission for that time and place by carrying the Gospel to all the inhabitants of what is now Turkey. You know the history of the church in that area. Luke wrote: “So mightily grew the word of God and prevailed.” (Acts 19:20) Whatever Paul did at Ephesus needs to be repeated again throughout the whole 20th century world. God’s command to Adam was “Be fruitful, and multiply, and replenish the earth, and subdue it and have dominion.” (Gen. 1:28). Man has done that. He is now walking on the moon, living at the bottom of the ocean, doubling his store of knowledge every few years and now he says that he is close to reproducing living matter in the laboratory. He has so thoroughly carried out his original assignment that he has now produced a terrifying ecological imbalance that threatens to destroy him. Obviously, the task of world evangelization is to continue until the end of the world. The obligation is still binding. The Great Commission has not expired and is applicable today. We have taken a strong stand on some of the complicated facets of Christian theology, but in the Great Commission there is a wonderful simplicity. Jesus is calling for uniformity of action and singleness of purpose: Christians are to go into all the world and preach the Gospel to every living person. It is a call to action — a command to total evangelization — a commitment to proclaim the Gospel to every person. The message of that first century Church was uncomplicated. Jesus Christ, the Son of God, was crucified and buried, but on the third day He rose from the dead. Forty days later He ascended to the Father and He promised to return. The early declaration of faith did not reply to all the questions that men were asking, but it did give an understandable series of concepts for the evangelization of the people. We must believe that we are justified in changing the religious beliefs and the moral behavior of the people. We must believe that Jesus Christ is the only way to God and that all other religions, beautiful and presently helpful as they may appear, are inadequate. Man is separated from God by his sins and he will invent substitutes. Without a living knowledge of God man has degenerated and developed his heathen religions and cultures. Underneath the surface there is still a hunger that is not satisfied apart from Christ. The primary motivation for world evangelization is a love for our fellow men and a firm belief that all who do not accept the Gospel of Jesus Christ are hopelessly lost and condemned to eternal separation from God. If Jesus Christ is right, then all the world must be evangelized and we must make converts among all other religions. The magnitude of the Great Commission is a frightening challenge to our embryonic denomination, especially in view of the lack of missionary vision in our time. We cannot answer for the ages that are past, but we are responsible for every man, woman and child in every community in every cultural group in our generation. It is for today that we must answer to God. Anybody can believe in the sovereignty of God when the situation is under control, but when things get out of hand, when right is on the scaffold and wrong is on the throne, it is then that the purposes of God are being worked out according to His plan. This is no time for retrenchment — no time for retreat. The doors ARE open. The fields ARE white. The laborers ARE few. The closed doors are God’s responsibility while the open doors are ours! We are to pray the Lord of the harvest to send the laborers. The success of world missions is not to be measured against past accomplishments or present gains, but by the realistic progress toward the fulfillment of the Great Commission and the response of the Church to pursue its task with faith and vision. What will you do about it? As you stand at the crossroads, what will your decision be? I promise you difficulties and dangers. Messengers of the cross have been hunted and hounded, whipped and flogged. Some have given their lives. But the mandate has not been rescinded. Jesus Christ is the Head of the Church and the Lord of history. Leaders come and go — nations rise and fall — civilizations wax and wane, but the worldwide mission of the Church will continue to the end of the age.